Despite all of the woes involving Brexit, Rolls-Royce is still doing very well globally. There’s one new model, in particular, that’s greatly attributing to high sales, the Cullinan SUV. 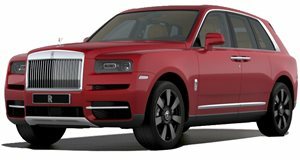 Automotive News has learned from the CEO of Rolls-Royce America, Martin Fritsches that Cullinan order books are full through July, and new orders are still coming in from anxious and wealthy customers. In fact, the high demand for the Cullinan has pushed the Rolls-Royce factory in Goodwood, England to full capacity. It’s not exactly a bad problem to have but it’s also annoying when there’s simply not enough vehicles to sell and buyers are lining up. Rolls-Royce did hire an additional 200 factory employees last year, but there’s still only 2,000 people employed at Goodwood. What’s also interesting is that half of Cullinan buyers are new to the brand, many of whom are women and younger overall. Existing Rolls-Royce customers want to buy a Cullinan because they see it as a natural part of their collection. The fact that it can be driven year-round and in the snow is an added bonus. You don’t go driving a Dawn convertible in the middle of a snowstorm, even with the top up. The high demand among Cullinan buyers was also likely fueled because the English firm first teased it back in 2013 and publically confirmed it in 2015. Meanwhile, rival Bentley launched the also highly successful Bentayga. Loyal Rolls-Royce customers were forced to watch from the sidelines as their Bentley-loving neighbors were enjoying their luxurious new SUVs. But Rolls-Royce needs to meet Cullinan demand in a timely manner whether by expanding its manufacturing plant or hiring more workers, or perhaps both.